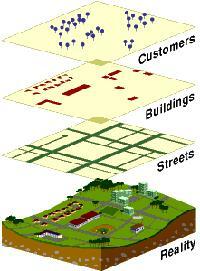 A Geographic Information System (GIS) is a technology that GIS descriptioncan be used to generate a visual profile of any spatially related information. In short, GIS can combine different layers of information about a particular place to make a dynamic and customizable map. With regards to this project, GIS can be used to generate a visual profile of the research that has been collected & stored in the electrification database. Other electrification information can then be added to the existing data. As part of the Millennium Development Goals, Ghana is employing several strategies towards poverty alleviation. A key approach has been the Rural Electrification Program, which strives to provide modern energy services throughout Ghana, with the aim of improving social and economic conditions. The master plan entails electrifying the entire country by 2020. The electrification mapping project involves identifying and cataloguing the electrification status of each community in Ghana. The project aims to clearly identify the electricity use in all communities in Ghana, and to detail which services are planned in the near term for those communities that are currently un-electrified. 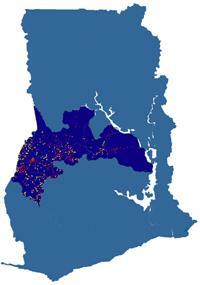 The purpose of the project is to develop a GIS map, and a centralized database resource on electrification in Ghana. The data resource & map would offer an inclusive report on the present and projected status of rural electrification. This information package would offer planners, policy makers, entrepreneurs and NGO’s a clear understanding of what energy services are presently in place, or are lacking, and provide guidance in developing appropriate electrification options. Moreover, once assembled into a digital format, the research data will then be available to any interested parties. This centralized approach will, hopefully, reduce the need to replicate work that has already been done. The final results yielded a full-scale GIS map of the electrification status in the Brong Ahafo region (the region is shown on the map above).